Fair Trade Keswick | Strawberry Tea: Lucky with the Weather! Strawberry Tea: Lucky with the Weather! 17 Jun Strawberry Tea: Lucky with the Weather! Against all forecasts Sunday afternoon turned out fine for Keswick and District Fair Trade Campaign’s annual Strawberry Tea at Castlerigg Manor Catholic Diocesan Youth Centre on Manor Brow, held with the support of the Youth Centre’s team, led by Father John. Takings on the gate were about £580 and the raffle, with generous contributions from Lakes and Dales Coop and Booths, brought in another £160. 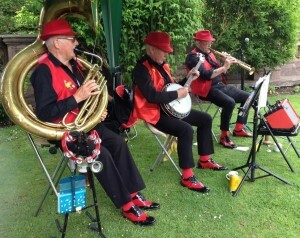 The talented Carlisle-based Ragtime Rascals again serenaded the event (see picture).